Recent release “Oklahoma Way” from Page Publishing author Jay Kennedy is a thrilling story of Jess Robinson’s journey in finding out who has killed his sister, with twists and turns along the adventure-packed travel as he struggles in the middle of a cattle baron’s diabolical plot. Jay Kennedy, an aspiring best-selling author who is fascinated in western legend, has completed his new book “Oklahoma Way”: an extraordinary story of Jess Robinson, a hunter with a goal to discover his sister’s killer who does not let his prey get away, and a seemingly win-win proposal he faces in Lightning Creek, the killer’s hometown. Published by New York City-based Page Publishing, Jay Kennedy’s suspenseful story of seeking justice for a tragic death. Jess Robinson’s mission of chasing a killer and the scenarios he has faced also depict what it means to demand for western justice. 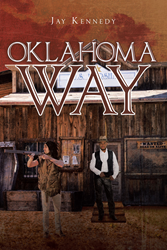 Readers who wish to experience this exciting work can purchase“Oklahoma Way” at bookstores everywhere, or online at the Apple iTunes store, Amazon, Google Play, Kobo or Barnes and Noble.